With peace negotiations again on indefinite hold, the Israeli government is still determining the best course of action given the recent unity deal between the Palestinian Authority and the terrorist organization Hamas. Observers from across the world are keeping a keen eye on both parties, eagerly waiting the next turn of events. 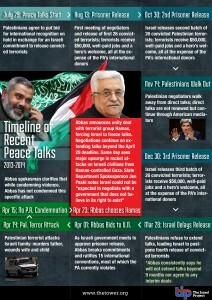 Here is a summary of the last nine months of peace talks from The Israel Project. July 29, 2013: The Palestinian Authority agrees to halt their bid for international recognition, but only if Israel agrees to release convicted terrorists being held in Israeli jails. August 29, 2013: With the first meeting of Israeli and Palestinian negotiators underway, the release of convicted terrorists commences. The previously incarcerated terrorists all received a hero’s welcome, $50,000 and well-paid jobs—all of which come at the expense of the PA’s international donors. October 29, 2013: Israel releases the second batch of convicted terrorists, 26 in total. They all receive the same monetary compensation and employment opportunities as their August counterparts. November 14, 2013: The first major setback in peace negotiations, as Palestinian Authority negotiators walk away from direct talks. Although discussions continue via America mediators, direct talks between the Israeli government and Palestinian Authority are not renewed. December 30, 2013: The third wave of 26 convicted terrorists are released from Israeli jails, each one receiving the compensation, employment, and a hero’s welcome. 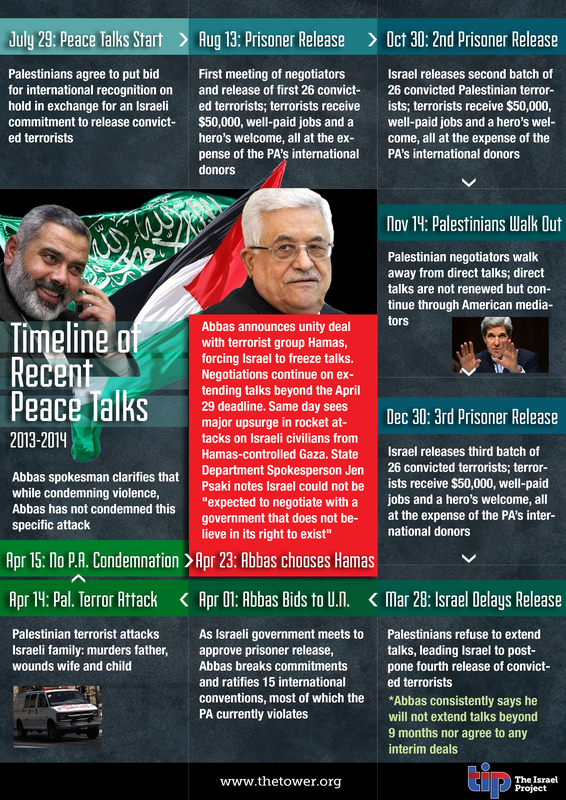 March 28, 2014: After Palestinian Authority President Mahmoud Abbas consistently states that he will not extend talks beyond nine months, nor will he agree to any interim deals, Israel decides to delay the fourth release of convicted terrorists. April 1, 2014: With the Passover holiday approaching, and Israeli officials meeting to approve the next phase of prisoner releases, Mahmoud Abbas breaks previous commitments and ratifies fifteen separate international conventions, most of which the Palestinian Authority already violates. April 14, 2014: As an Israeli family travels to celebrate the beginning of Passover, their car is attacked by terrorist gunfire, killing the father and wounding the mother and child. April 15, 2014: The day after the attack, Mahmoud Abbas’ spokesman clarifies publicly that while Abbas condemns violence, he has not condemned the specific attack on the Israeli family. April 23, 2014: Shocking many, Abbas announces the unity agreement with Hamas, which has been designated as a terrorist organization by Israel, the United States, and the European Union. The move forces Israel to freeze further talks, though negotiations to extend talks past the April 29 deadline continue.